Worshippers at the Western Wall (the Kotel), in Jerusalem. It is the holiest site in the world for Jews. Welcome to our site! Our aim is to become your website of choice for information about Israel. We've divided the site up into different areas of interest, from tourism to the military. If there's a particular area you'd like more information on, please let us know! We're always looking for new ways to improve the site. Visit our Online Store to purchase great StateofIsrael.com t-shirts, mugs, sweatshirts, lunchboxes, and much, much more! Interested in advertising on StateofIsrael.com? Please contact our advertising department. Get a free e-mail account at StateofIsrael.com! Click here for more information. We love to receive e-mail from our visitors! Check out some of the letters we've received, along with our responses. Basic Information : Information about government, health and cleanliness, language, video, electricity, and currency. Arab-Israel Conflict : This section retraces the history of the Arab-Israel conflict, from the First Aliyah at the end of the nineteenth century, to the present-day Middle East Peace Process. Prime Ministers of Israel from 1948 until the Present : Photos and timeline of Israeli prime ministers from the state's inception to the present, as well as the party affiliation of each prime minister. Balfour Declaration : The complete text of the Balfour Declaration of October 31, 1917 - which was put forth by the British government and which helped to lead to the State of Israel's eventual establishment. Article 22 of the Covenant of the League of Nations : The complete text of this portion of the Covenant of the League of Nations. Promulgated on June 28, 1919, this portion of the Covenant - along with the Balfour Declaration - formed the basis for the establishment of the British Mandate government, the last government in charge of Palestine prior to the creation of the State of Israel in 1948. Palestine Mandate of the League of Nations : The complete text of the League of Nations document - put forth on July 24, 1922 - that created the British Mandate government in Palestine. United Nations General Assembly Resolution 181 : The complete text of the November 29, 1947, UN resolution, which terminated the British Mandate in Palestine and established the independent State of Israel one year later. Declaration of Independence : The complete text of Israel's Declaration of Independence. 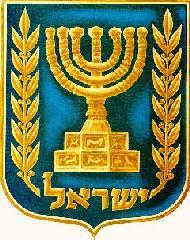 HaTikvah ("The Hope") : Includes all the words to Israel's national anthem. Online Store : Purchase great StateofIsrael.com t-shirts, mugs, sweatshirts, lunchboxes, and much, much more! Political Parties : Links to Israel's political parties. Tourism : Information about places of interest in Israel. Links : Various Israel-oriented links on the World Wide Web. Your letters and our responses! *Please note: StateofIsrael.com is not an official Israeli government website. It is neither sponsored nor endorsed by the Israeli government! It was created and is run by Israelis and Zionists and is dedicated to all who care about the welfare of the State of Israel. over the entire Land of Israel. When the current conflicts are concluded, we will analyze them - in as objective and neutral a manner as possible - in our Arab-Israel Conflict section. *StateofIsrael.com is providing this message as a public service for our visitors. We are in no way associated with the writers of the message and take no responsibility for its accuracy. is owned by State of Israel.com.